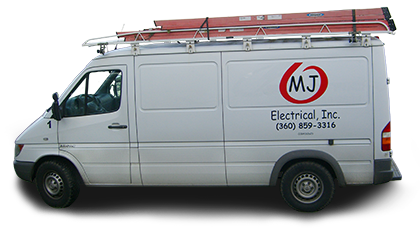 MJ Electrical Inc. is Washington’s premier residential and commercial electrical contractor proudly serving our customers for over 7 years. When you need a trusted, reliable contractor that cares about your needs and the needs of your home or business, MJ Electrical is here for you. We offer a wide array of electrical contracting services designed to provide real world solutions for all of your electrical needs. Headquartered in Brush Prairie, Washington, MJ Electrical was founded in 2007 under two very important principles which we still live by to this day: to offer our customers an alternative to the high-priced contractors who are only interested in your money and to give our customers a higher level of service and support that is unmatched by anyone else in the industry today. Contact us today and find out why we are the only choice for customers who want quality and affordability. MJ Electrical Inc. has the training and experience necessary to get the job done right the first time. We offer new construction, remodeling and solar installations for both commercial and residential customers. Our staff is friendly, knowledgeable and dedicated to serving your needs. MJ Electrical Inc. strives to give you a higher level of service and we guarantee your complete satisfaction with every service call; you have our word on it. We appreciate your continued patronage and support over the years and we look forward to serving your needs well into the future. To learn more about our services or to set up a service call, feel free to contact us and one of our representatives will be happy to assist you and answer any questions you might have.